Yes, they are. Use our 1888 number lookup search tool to find 888 numbers now! 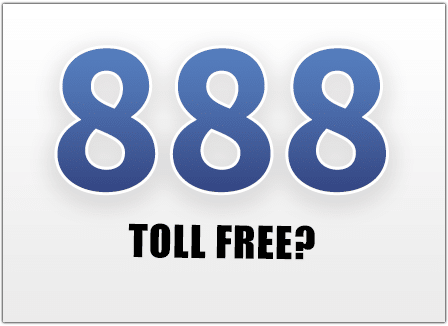 Are 888 Numbers Toll Free 800 Phone Numbers? Update 2018: Yes! 888 toll free numbers work the same as traditional 800 toll free numbers. You may also be wondering: are 877 numbers toll free? – And the answer is yes they are! With UniTel Voice, you can get a toll free number in any toll free number prefix or toll free number area code. This includes 888, 877, 866, 855, 844, and even the rare 800 toll free prefix. Want to find an 888 number for your business? Use our search tool below to lookup the perfect toll free number now. 1. 1-888 numbers are toll free just like 800 numbers. For all intents and purposes, there is no difference between 888 numbers and “True” 800 numbers. Toll free 800 numbers were first released in 1963. As the availability for those numbers dwindled, the FCC released more toll free area codes (888, 877, 866, 855, 844 and 833) to keep up with demand. Even though the need for to call “toll free” isn’t as great as it was in the past. The majority of businesses still use toll free numbers for marketing purposes. In the telecom industry, it has become acceptable (because of common use) to refer to “toll free area codes” as “toll free prefixes”. 2. You can search for available 888 numbers on UniTel Voice’s site for free. Just click the “Get a Toll Free Number” button below and it will take you to our sign up page, allowing you to choose a number. You can use the search field to lookup available 888 numbers and instantly reserve them. Our search tool has a direct, real-time API with the National Toll Free Number Database where all available 888 numbers are housed. 3. If you cannot find the 1-888 number you’re looking for there are alternatives. Can’t find the 888 number you’re looking for? Consider getting a toll free number with a newer prefix like 855, 844, or 833. Because there are more of these toll free numbers available you’re more likely to find one that spells the word or phrase you want.